Optimize your Natural Ability to Heal. Doctor, Author, a pioneer in the belief that "Food is Medline" and co-founder of The Preventive Medicine Center (PMC), Dr, Robert Silverstein has been one of this country's innovative leaders in health and wellness. Professional speaker, author, vastly experienced Board Certified Cardiologist and winner of the Outstanding Practitioner from both the International Society of Hypertension in Blacks and the Connecticut Holistic Health Association is an University Professor. 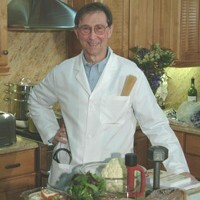 Dr. Silverstein is from the normalcy of the Midwest, the friendliness of the South, and the sophistication of the East. 30 years of Cable Access TV and professional speaking, he listens to either his audience or patients and helps them align with their own inner truths." Based on his CAIM (Complementary-Alternative-Integrative-Medicine) approach, Dr. H. Robert Silverstein outlines a program that integrates modern medical practices with alternative and ancient forms of healing. Recalling the work of Andrew Weil and Larry Dossey, the book argues that our self-healing mechanism—the immune system—is more powerful than we think. If we make wise diet and lifestyle changes, says Silverstein, the immune system can function at an optimal level, restoring health and preventing future illnesses.